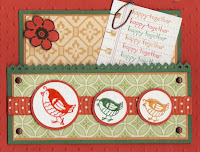 I love this set -- it reminds me of the Partridge Family! And who didn't love that bus of theirs? I layered Dusty Durango, Garden Green, More Mustard and sheets from the Haiku ds. The piece of notebook paper is from The Write Stuff ds -- I added the spiral punch along the edge. The partridges and flower are stamped out in craft ink and clear embossed, with the exception of the large partridge -- that one was overstamped with Versamark, then clear embossed. The card base was run through the Big Shot using the Perfect Polka Dots Textured Impressions folder. Where is my comment?!!? That makes me so mad when my PC disconnects from my on-line service. I said some awesome things about this card - REALLY, REALLY!! One of them was how much I loved multiple sentiments on the note card -- so cute!! You will have to trust me on the other awesome comments.